When is Ellmau going to get fresh snow? This is the Snow Forecast and Weather Outlook for Ellmau, Austria from 21 April. The next notable snow forecast for Ellmau is 7cm3in, expected on 28 April. There is significant snow currently indicated by the long-range (7 days+) forecast; but too far ahead to be relied upon. Snow Line ranging from 1,496m4,908ft to 881m2,890ft, with rain below. Snow Line ranging from 1,496m4,908ft to 1,035m3,396ft, with rain below. Snow Line ranging from 1,496m4,908ft to 727m2,385ft, with rain below. Snow Line ranging from 1,342m4,403ft to resort level. Snow Line ranging from 1,342m4,403ft to 1,035m3,396ft, with rain below. Snow Line ranging from 1,342m4,403ft to 881m2,890ft, with rain below. Ellmau Snow Forecast built at 20:12, next update at 02:00. 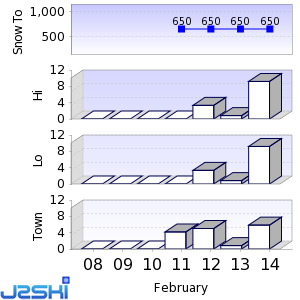 Snow and Weather Forecasts for other popular Ski Areas near Ellmau.